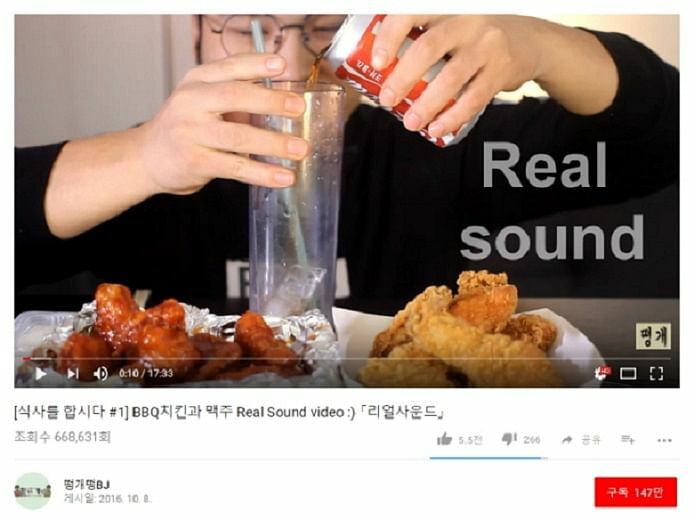 (THE KOREA HERALD) - One of the latest fads in Korea’s ever-evolving culture of “meokbang” (also spelled “mukbang” ) or eating videos, is “real sound,” where YouTubers capture their chewing noises. Lee Tae-goon and Lee Min-joo are brothers who run the YouTube channel Ddeonggaeddeong, devoted to the siblings and their friends eating and carefully chewing in front of a high-quality microphone. The soundbites of food being savored in the mouth are clearly delivered to the viewers’ earphones. According to chef Park Jun-ha, who runs the meokbang YouTube channel Sof, sounds add to the satisfaction of meokbang. “Sounds help describe the texture of a fried food or the chewiness of noodles,” he said at a conversation between Korean and Taiwanese mukbang creators at Google’s Seoul Campus last Thursday. Though Korea’s “real sound” YouTubers take care to close their mouths politely while chewing, Taiwanese YouTubers confessed that amplifying eating noises was still an unfamiliar concept in their country. “In Taiwan, we’re taught that we have to close our mouths and be very clean when eating,” said Taiwanese meokbang creator A-May. And though such manners are emphasized in Korea as well, A-May said that Koreans seemed “more open and free” in their eating culture. “The sounds make the clip feel more honest, like you are actually right there next to the person eating. It’s different from Taiwanese meokbang,” she said. Online eating videos, which first originated in Korea around 2010 on video-streaming platform Afreeca TV, have since branched out abroad. As of 2015, the keyword “meokbang” was searched more in English than in Korean online, according to Google Trends. 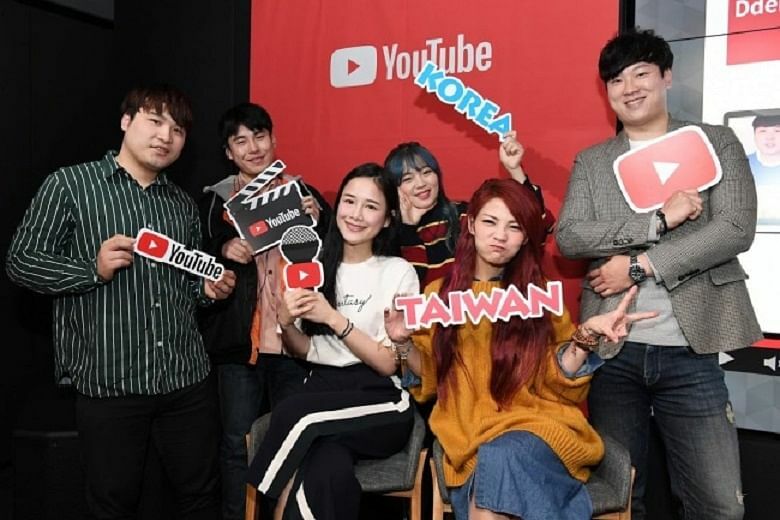 Meokbang videos have risen to considerable popularity in Taiwan as well, said Taiwanese YouTuber Chien, who has signed up more than 320,000 subscribers. “Because everybody is busier these days, they have less time to meet people. I think viewers enjoy the feeling that they’re eating with someone when watching meokbang,” she said. With the growing fame of meokbang abroad, it has become a natural step for Korean YouTubers to globalize their content. YouTubers said they’re paying more attention to subtitles, diversifying the types of food they eat and seeking to film in different countries. Over half of Ddeonggaeddeong’s 1.4 million subscribers are viewing the videos from outside of Korea. “We’re gearing up to go film abroad. We’re gathering a crew right now to develop globally-focused content,” said Lee Tae-goon of Dddeonggaeddeong. Korean YouTuber Sini focuses on the mix of travel and meokbang on her channel. “Because communication is so active through social media now, my viewers request I go certain places when abroad. I ask them for recommendations for places to eat. It’s a fun process,” she said. Storytelling methods are constantly evolving as well, said Sof’s Park. While people used to watch meokbang for the vicarious satisfaction of eating, viewers are now requiring more entertaining storylines, he said. For instance, Park was requested to promote the Pollack roe product of an up-and-coming food company in collaboration with online retailer Gmarket. Rather than simply eating the food in his video, Park decided to create a story about an ancient detective in search of the perfect Pollack roe cream pasta. “It’s nonsensical, but people found it really funny on YouTube,” he said.